Speake-Marin is very proud to have been given the honour of designing and creating CronotempVs II, the second ‘club watch’ for the CronotempVs private collectors’ club. CronotempVs II features a casual, contemporary style. It has superb legibility thanks to a black resin dial with central Super-LumiNova filled hour and minute hands, which are complemented by Super-LumiNova numerals, indices and instantaneous date. CronotempVs II is powered by an automatic winding Eros movement with five-day power reserve, housed in a slim Piccadilly case in stainless steel. CronotempVs is a private club in Spain formed by watch collectors with the common interest of advancing their knowledge of high-end watchmaking, sharing this knowledge, organising social events and commissioning bespoke timepieces. Speake-Marin had the pleasure of welcoming CronotempVs members in Switzerland to receive their specially commissioned watch in person. 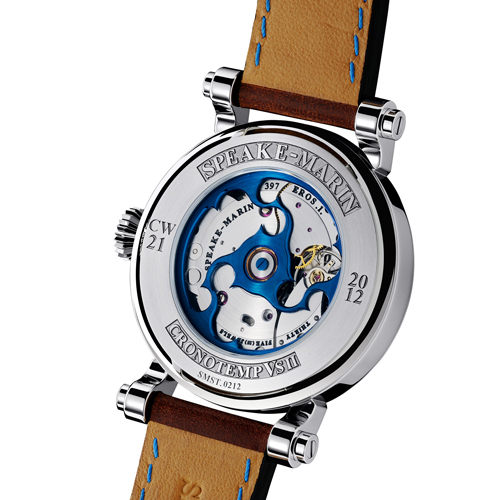 CronotempVs member Dario Fernandez de Villavicencio said: “We chose Speake-Marin to make our second CronotempVs commissioned piece because Speake-Marin has a very distinct DNA and philosophy, and because of the team behind Speake-Marin and their ability to empathise, to share and to be flexible. “The possibility to receive the watch from the hand of the man that signs the watch was also important. CronotempVs II is a limited edition of 21 pieces especially created for the CronotempVs collectors’ club. CronotempVs II’s pure, black resin dial throws into sharp relief the central hour, minute and second hands, as well as the instantaneous date window at 2 o’clock. Powerful Roman numerals at 12, 3, 6 and 9 o’clock in white Super-LumiNova and the hour markers – filled with cream Super-LumiNova and flush with the dial – maximise readability by both day and by night. The date disc is also in cream Super-LumiNova. Three-dimensional Super-LumiNova also provides the hour and minute hands (cream) and minute markers (white) with superlative legibility, while adding more than a touch of masculine vitality. The 2 o’clock position of the date window and use of Roman Numerals (rather than Arabic numerals) for the second day of the month subtly reminds us that this timepiece is the second limited edition to be made for the CronotempVs collectors’ club. 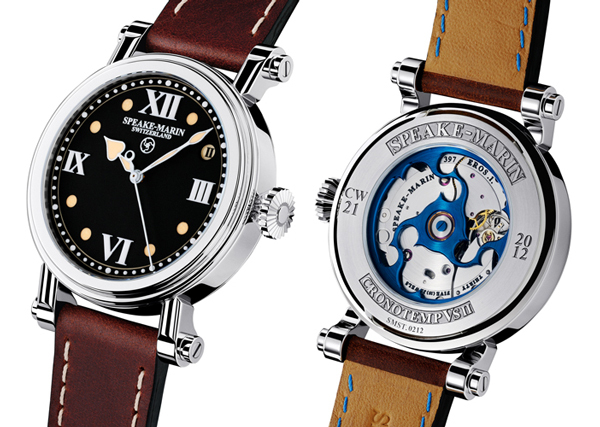 The dial is completed by the Speake-Marin signature ‘topping tool’ logo and brand name, both in white just below 12 o’clock. 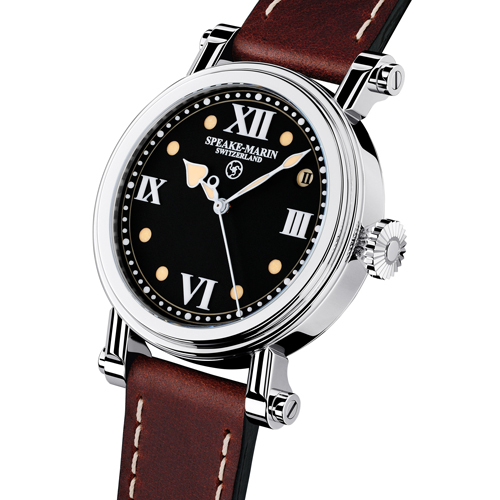 The iconic stainless steel Piccadilly case with soldered lugs bears all the hallmarks of Speake-Marin’s meticulous quest to create classical, durable timepieces. At first glance the three-piece case appears similar to Peter’s original Piccadilly design, but on closer inspection it can be seen that this one is much slimmer – 42mm in diameter and just 12mm in height – an elegant design made possible by the Eros calibre. The Eros calibre is an automatic winding movement and features a long, five-day power reserve and the signature Speake-Marin ‘mystery’ winding rotor. The large diameter, circular-grained movement dominates the view through the display-back and provides a technical backdrop for the beautifully finished rotor. The engraved number on left side of case back (CW- -) is the CronotempVs member’s personalised number; the CronotempVs members have pieces 01 to 20. A 21st piece has been retained by Speake-Marin. The “2012” engraved on the right side represents the year of production. CronotempVs II is completed by a brown calf leather strap with white stitching on top and blue stitching underneath to match the blued rotor. “The main goal of our commissioning bespoke watches for the CronotempVs club is to learn something. The most important is to look for something that nobody in the club has or has not considered buying until now. The process is not only to buy a watch but also to get to know the company and people behind it.